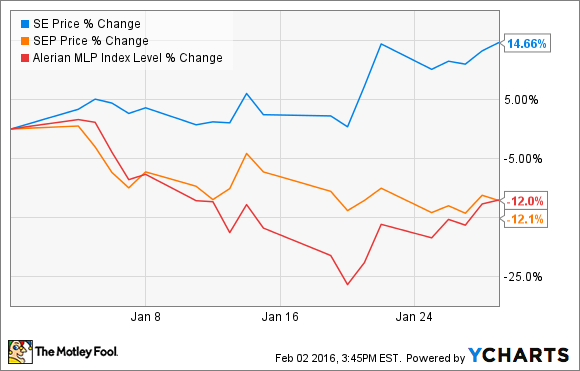 How Did Spectra Energy Gain 15% in January While Spectra Energy Partners Lost 12%? One company, two completely different stock directions. Who say the market is logical? What: Shares of Spectra Energy (NYSE:SE) enjoyed a nice 14% gain in the month of January despite shares of its subsidiary partnership, Spectra Energy Partners (NYSE:SEP), losing 12% in the same month. Some might point to a big oil price gain in during the month that caused Spectra's shares to pop close to 15% in a day, but a quick look at Spectra's business model would show that barely makes sense. So what: It's pretty natural for energy companies to bounce up and down with the prices of oil and gas. Indices and investors making broad bets on energy prices will ostensibly make these stocks move. That can even be the case with pipeline and midstream companies even though they are mostly insulated from prices. Spectra Energy and Spectra Energy Partners, though, aren't just somewhat insulated from oil and gas prices, they are probably the most insulated from oil and gas prices among the major pipeline and transportation companies. All of the company's business segments generate 95% or more of their revenue from fixed fees, and many of the company's assets are geared toward transmission and distribution on the demand side, which is slightly more consistent than being on the supply side of the pipe. Considering the insulation the company has from commodity prices, it's hard to see what investors would tie the company's share price to the movement of oil or gas prices at all. Spectra Energy Partners, more than anything else, was a victim of the broader trends of the master limited partnership space. The Alerian MLP Index fell by 12% itself in January, and since Spectra Energy Partners is a component of the index, shares are going to move with the rest of them if it deserves it or not. Now what: There are going to be plenty of cases like this were factors almost completely unrelated to a company will move a stock by large amounts. For investors, the key is being able to sift through these distracting elements and focus on the fundamentals of the business. In the case of Spectra, there are certainly reasons to like what the company is doing right now with its impressive growth projections, but do be aware that it could get tripped up along the way. Focusing on things like the company's ability to manage its debt profile while looking to add billions in new assets will likely be something worth watching instead of whether oil and gas prices move Spectra's stock price.